which was held at Gwanghwamun Plaza On 14th October. For Koreans, Arirang is the unofficial anthem and the heart song of Korea. 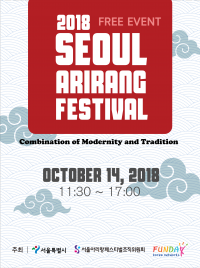 Our main purpose of this event is to let people discover the true meaning of Arirang. performances and cultural experience programs and joined the Arirang parade with locals. 한국인과 함께 하는 퍼레이드에 참여하였습니다.